Tax-deductible contributions may be made by credit card online at NYFA . All contributions over $2500 must be accompanied by a contribution letter. Mail to SheilaLynnK Art Studio, 345 South Main Street, Wellsville, NY 14895. 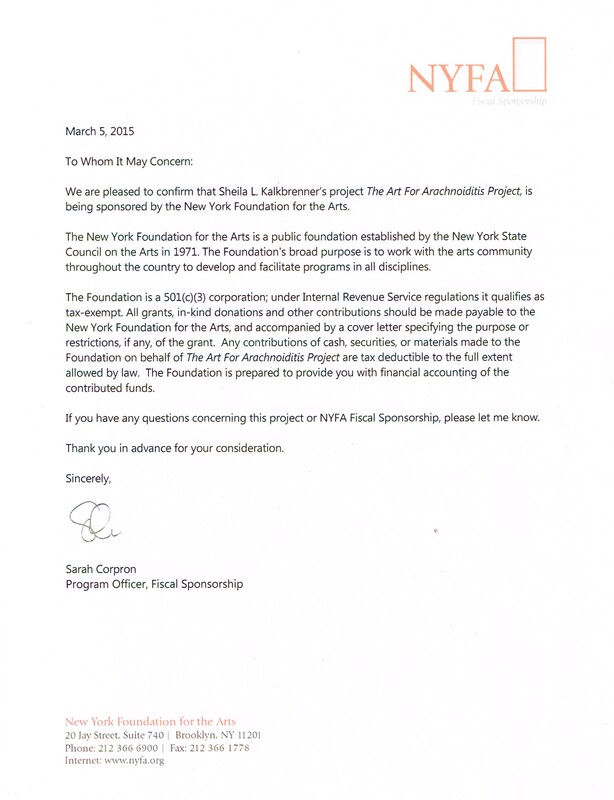 This check will then be deposited to the project via our NYFA account. Arachnoiditis Survivors are NOT in any way obligated or expected to provide or secure funding for the Art For Arachnoiditis Project. This project has been developed FOR fellow arachnoiditis survivors. Please do not solicit them for funding. However, feel free to share these details with any other advocate, individual, or business entity who may be interested in supporting the Art For Arachnoiditis Project. Our first exhibit will be open to the public April 18-May 8, 2015, at the Fountain Arts Center, Belmont, NY. Opening Reception April 18th 1-4pm. Over 70 entries of art and photos by Survivors were received. Approximately 55 pieces of Artwork by Survivors will be displayed at the exhibit. SIX Survivor Portraits created during Arachnoiditis Survivor:A Portrait of Resilience Against Patient Harm Technology permitting, videos of these portraits in progress will also be presented during the opening reception. Map of Survivors ~ over 190 locations around the world registered by Arachnoiditis Survivors via the Art For Arachnoiditis Project marked on a world map with Arachnoiditis Awareness map pins. The Ostrich cot will be available for Reasonable Accommodations practice and demonstration purposes.